With 225 kilometers in length and 90 kilometers wide, Cyprus is the third largest island in the Mediterranean after Sicily and Sardinia. Although geographically it belongs to Asia, politically and culturally it is mostly counted as Europe. In addition to good weather, beautiful beaches and cultural treasures, you can find above all one thing: vegan cheese in all shapes, colors and flavors! Here you will learn everything you need to know. After Greek coup leaders wanted to enforce the annexation of Cyprus to Greece in 1974, the north of Cyprus was occupied by the Turkish military. Since then, Cyprus has been de facto divided. 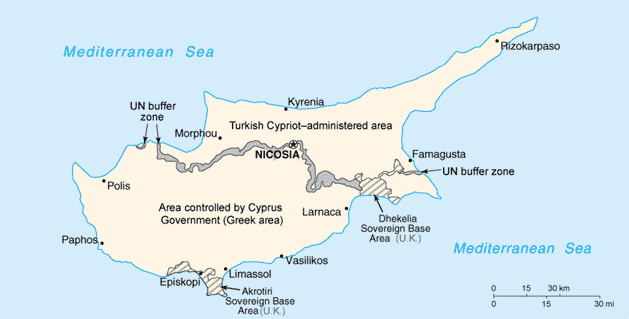 According to international law, the whole island belongs to the Republic of Cyprus, but the northern part continues to be controlled by the Turkish Republic of Northern Cyprus, which is only recognized by Turkey. Between the two areas there is a buffer zone (Green Line/πράσινη γραμμή/yeşil hat), which also divides the capital Nicosia and is monitored and managed by United Nations peacekeepers. Since May 1st of 2004, the Republic of Cyprus, with its internationally recognized territory, is a member state of the European Union. The Turkish north of the island is thus also EU territory, but the Republic of Cyprus can not exercise its right there. All of the following descriptions refer only to the southern part controlled by the Republic of Cyprus. Why is Cyprus vegan friendly? The Greek magic word for vegan products is nistisimo (written: νηστίσιμο or ΝΗΣΤΊΣΙΜΟ). That means “fasting”. Many Cypriots fast during 90 days a year and in that time period eat almost vegan. That’s why there are vegan products and food everywhere. The exact fasting rules and times for Eastern Orthodox Christians can be read here. We were out of the Lenting season in Cyprus and still found many vegan products. Although, except in the weeks immediately after Easter and Pentecost and in the two weeks after Christmas, every Wednesday and Friday should be fasted, but only a few will stick to it. The biggest vegan offer is probably to be found during the “holy and great forty days of Lent” in the seven weeks before Easter, in Lent before the Dormition from August 1 to 14, and in Philip Lent from November 15 to December 24. Note that “nistisimo” doesn’t automatically mean “vegan” because, e.g. honey can be included. So check the ingredient list anyway! Where can I find vegan cheese and how much does it cost? The supermarket chain Papantoniou has the largest selection. 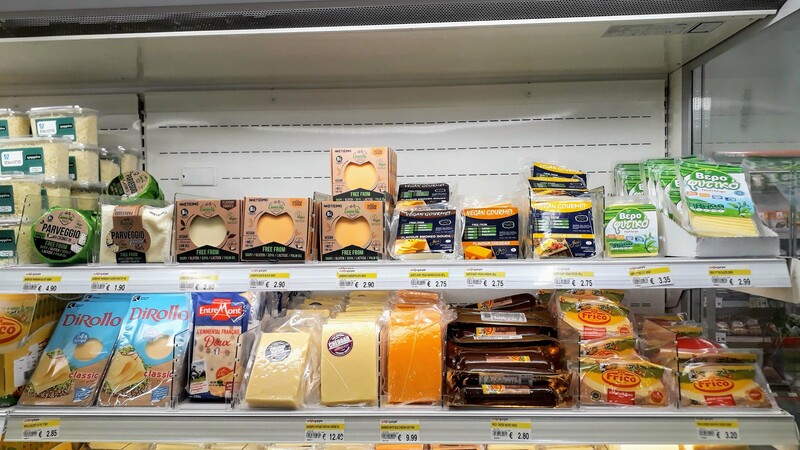 Here you will find up to seven different kinds of vegan cheese in 2.5-kilo blocks directly in the cheese counter (subject to availability). Prices are between 5.50 euros and 11.50 euros per kilo. In the photo on the right you can see our personal favorite (the one for 7.70€/kg). Although we found another cheese for 5.50 €/kg which we liked very much as well. You can recognize it by the packaging: It has very big and often the word “Vegan” on it (in the upper picture on the left). 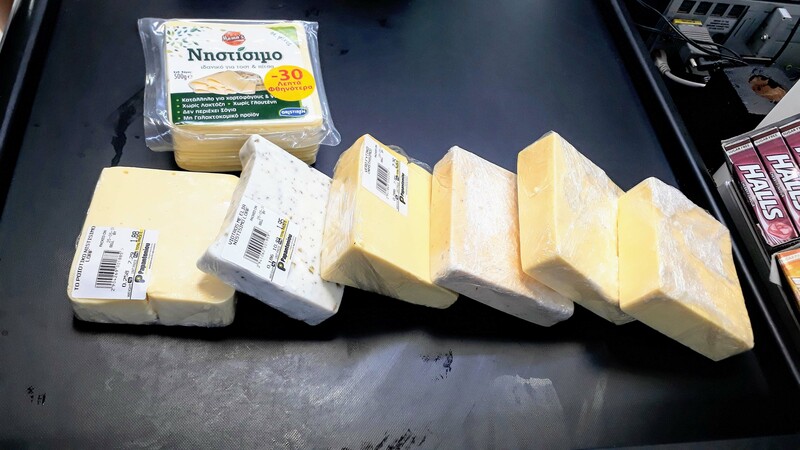 Generally, most cheeses are not only labeled as “nistisimo” but also as “vegan”. Also at AlphaMega you will find some vegan cheese blocks in the cheese counter depending on the respective branch. 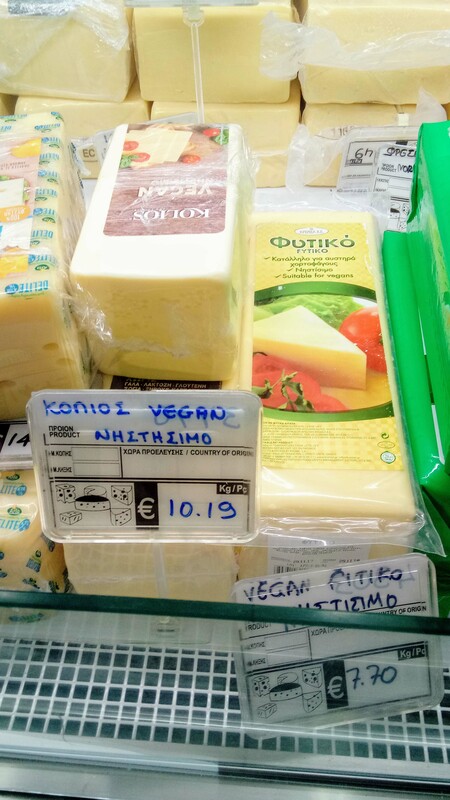 In almost every supermarket in Cyprus, there are also numerous packaged vegan cheeses in the refrigerated section. For example, from the Cypriot brand Green Vie, which has its headquarters in Limassol. Unfortunately, they did not respond to our request for a factory tour. 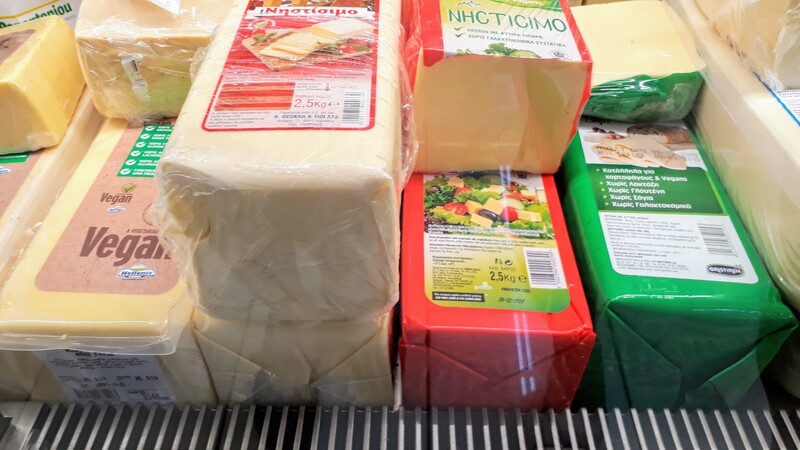 Can I export the vegan cheese? Yes, we already took several 2.5 kilo blocks with us without any problems. It may only happen that someone wants to take a closer look at your baggage at the airport, as the cheese on the baggage scanner might look conspicuous. However, we don’t know whether there is an official limit. 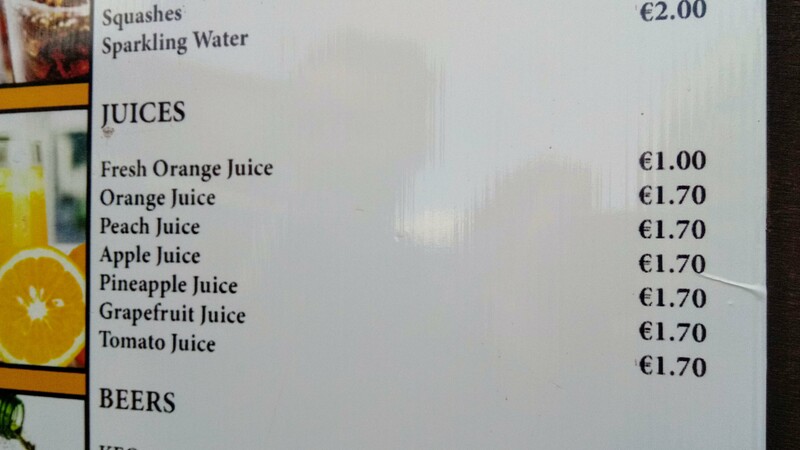 As you can see in the photo, in many cafés freshly squeezed orange juice is cheaper than the non-fresh juices. 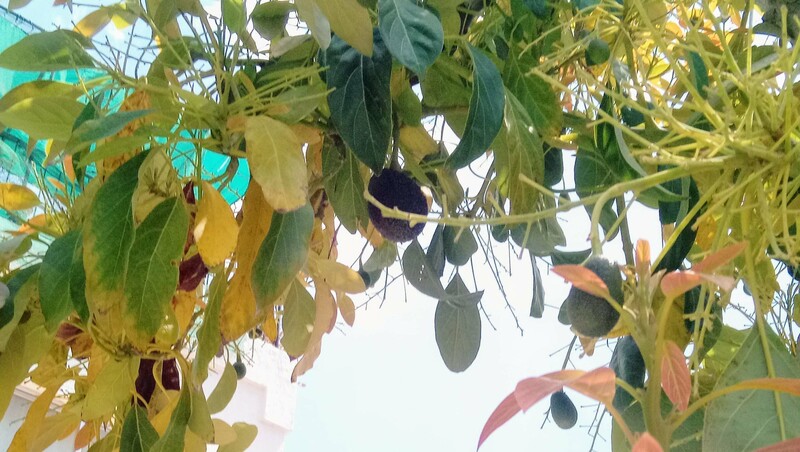 Moreover, avocados actually grow in Cyprus, so you can buy them here locally instead of the imported ones. However, there aren’t that many purely vegan restaurants yet, as can be seen on HappyCow: There is only one in Larnaca (Solar Kitchen Bar) and one in Paphos (Meraki Market Café). Although English is still a common language as a legacy of the colonial era and is spoken by many Cypriots, it does not hurt to know a few words in Greek. 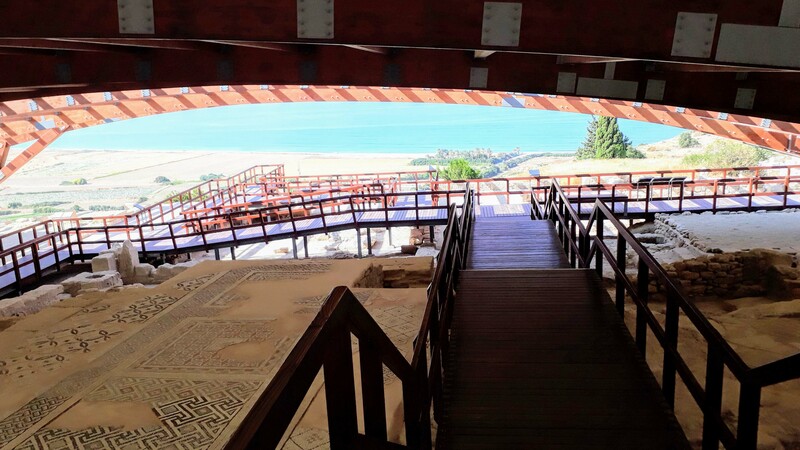 In addition to Turkish, Greek is one of the two national and equally official languages of the Republic of Cyprus. No, thanks! Orchi, efcharistó! Οχι, ευχαριστώ! For more questions regarding “Vegan in Cyprus”, you’ll get the answers in the Facebook groups Cyprus Vegan Society and Vegan Supermarket Finds Cyprus. 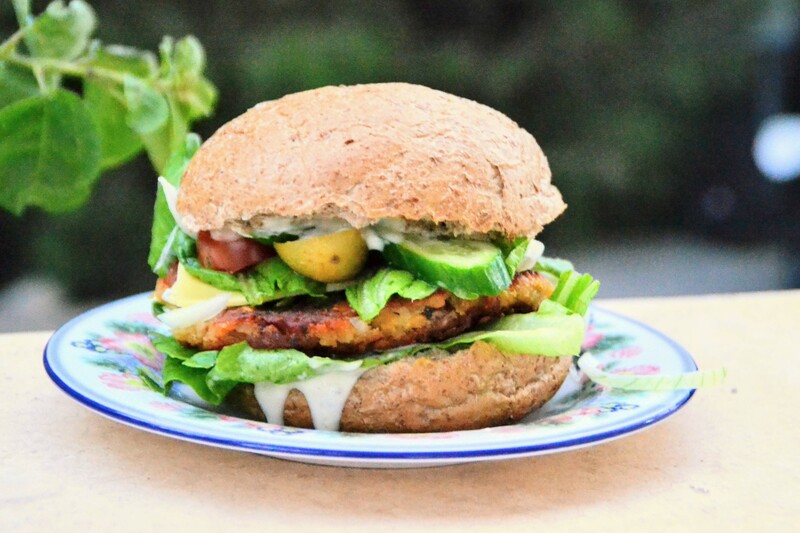 Furthermore, you can find vegan, vegetarian and vegan-friendly restaurants in Cyprus on HappyCow.